Fighting between a Karen ethnic armed group and the Burma Army ended in 2012. Now a once desolate conflict zone is set for a comeback. THATON, Mon State — The town of Thaton is located on the highway linking Burma’s commercial capital, Rangoon, with the Mon State capital city of Moulmein. When we arrive in a taxi, we are greeted by a muscular man with tattooed arms, who takes us into a liaison office of an ethnic Karen rebel group, the Karen National Union (KNU). He politely introduces himself, saying he will give us a ride to a base of the KNU’s military wing, the Karen National Liberation Army (KNLA). The base is home to the KNLA’s Brigade 1. Driving from the KNU office through thick jungle, I see and hear both the good and bad that has resulted from the bilateral ceasefire agreement between the KNU and the previous government in 2012. 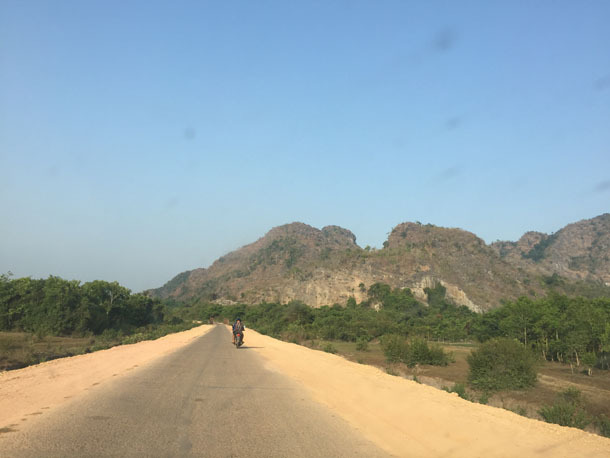 The trip to the KNLA base lasts about three or four hours, and we pass small streams, villages, paddy fields, small wooden and concrete bridges, hills, and Burma Army bases, riding on a dusty, bumpy half-finished road. 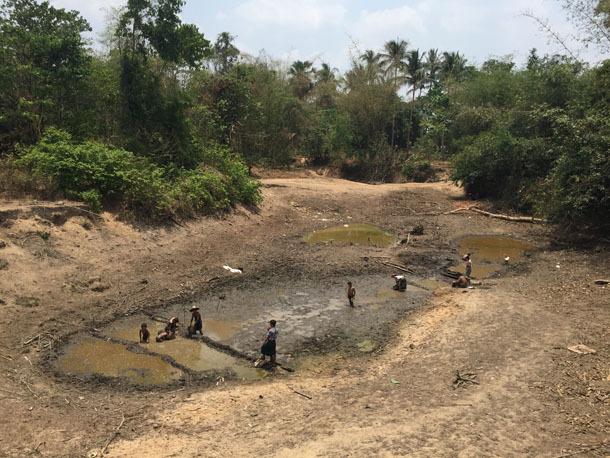 I see villagers bathing in streams, carrying water, farming, gardening, commuting on foot or by cart, building wooden and bamboo houses, selling snacks and liter-bottles of gasoline. Surprisingly, some of the villagers are using cell phones, a sign that the telecommunications infrastructure has penetrated deeper into the countryside than I had thought. 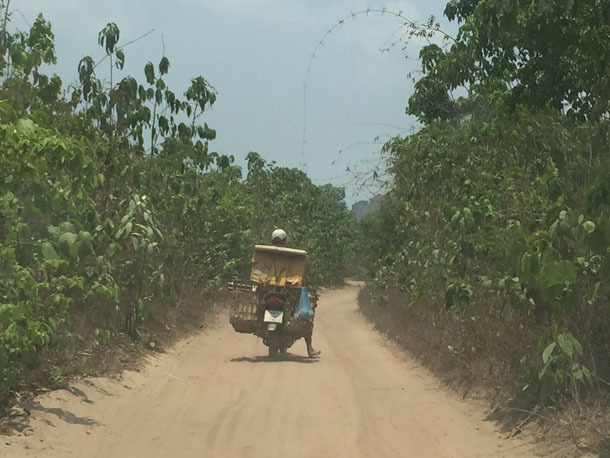 Some villagers have replaced their carts with motorbikes, and I pass by roads both new and under construction. Some would-be-streets remain dusty and incomplete. Traveling in an old Toyota truck without air conditioning, we keep the windows open. But clouds of dust occasionally blow in with the fresh air. Sometimes as dust gets inside the truck, we have to cover our noses or close the windows. The bumpy road makes it impossible to nap, and we stay awake the whole trip. A Burma Army truck comes into sight. The soldiers in the truck are fully armed but some, with their shaved heads, look like teenagers. It is April, and we guess these soldiers are probably returning to duty after shaving their heads and spending time in monasteries during the Burmese New Year, a not uncommon traditional among civilians and, it would seem, soldiers alike. Our driver Win Aung tells us that it was not possible to travel in these areas openly before the KNU reached its ceasefire with the Burma Army. He speeds up and passes the Burma Army truck. He says that driving side by side with a Burma Army truck on this road was unimaginable before the ceasefire between the KNU and previous military-backed government in 2012. The area was once a no man’s land. Frequent clashing between the Burma Army and the KNLA forced more than 3,000 villagers to flee their homes and seek refuge in Thailand. Many claim that at that time the Burma Army engaged in forced labor, forced portering, extortion and other human rights abuses. Further down the road, a brand new, white heavy-duty Toyota Hilux pickup drives by, and I see the letters UNHCR written on the windshield: the UN High Commissioner for Refugees. I’m curious how a UN refugee agency vehicle could be traveling that deep into KNU territory. Our driver Win Aung says that there are some projects in the area set up by a few nongovernmental organizations, including the International Committee of the Red Cross (ICRC) and the UNHCR. He says that a few NGOs built clinics and gave livestock to local villagers. However, the paltry assistance does not meet needs of local villagers, he says, and it is more like a show. He claims, for instance, the clinics were nicely built, but they are not actively operating. They are closed most of the time, leading the villagers to make a pun in Burmese calling them “closed clinics” rather than “medical delivery center.” As you might expect, it’s more amusing in the original Burmese. Win Aung says that another American NGO also promised to provide livestock like goats to villagers who want to raise them. But, later they asked the villagers to participate in a drawing to see who would receive the livestock. As we travel and chat about life in the one-time no man’s land, a beautiful sunset comes into sight and begins to fade. It is dark by the time we finally reach the KNLA base. In a wooden house running solar-powered lights, soldiers and officials at the KNLA base talk about the old and new days in their territory. On the government’s map, the KNLA Brigade 1 territory is in Thaton and Bilin townships in Mon State, a region the KNU recognizes as Doo Tha Htoo District. Whatever its name, the area is rich in farmland and rubber plantations. 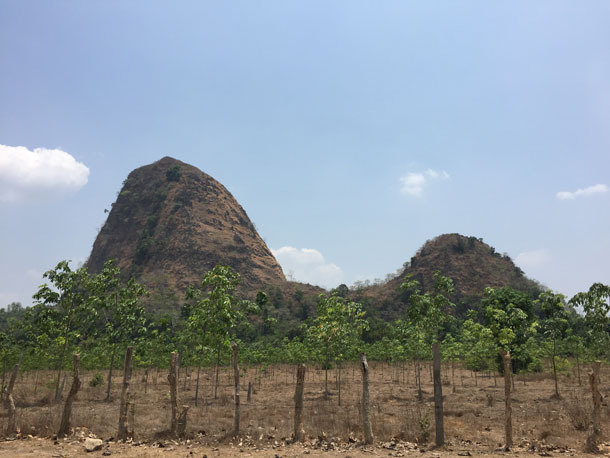 Most of the land is flat and has huge potential for business opportunities now that it is just a few hours’s drive from big cities like Rangoon, Moulmein, Hpa-an, the capital of Karen State, and the commercial border towns of Myawaddy and Thailand’s Mae Sot. After the 2012 ceasefire agreement was signed, the KNLA Brigade 1 units returned here and established its military bases. They only had temporary bases in the old days before the ceasefire was signed. These bases coexist with Burma Army bases in the region. “We didn’t build camps or live in this area in the past because it was a conflict zone. These houses are all newly built,” says Saw Min Thein, an official at the KNLA Brigade 1. A gathering of several wooden houses forms the headquarters of KNLA Brigade 1 and two armed soldiers guard the entrance gate. Soldiers at the base say this region was a shoot-on-sight zone and villagers did not dare to move around. Nowadays, villagers can freely travel and farm. Telephone networks are operational in some villages and there is even internet access at the Brigade 1 headquarters. More people use motorbikes, cars and trucks than carts. And land prices are going up. 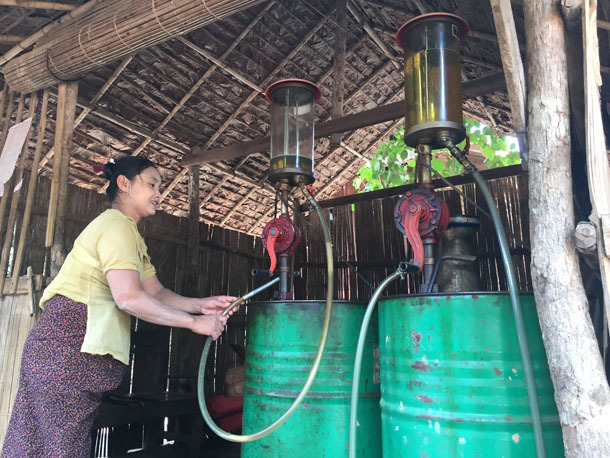 Large Burmese conglomerates like Max Myanmar Group and Phyu Min Tun Company are developing rubber plantations and cement factories. A rubber plantation of 5,000 acres resulted in heated land disputes between locals and Max Myanmar. Beginning in April 2015, with permission from the KNU, the Phyu Min Tun Company has also conducted tests for mineral extraction at one of the twin picturesque mountains on the main road leading to the KNLA headquarters. Local villagers are not happy with the tests run on Min Lwin Mountain as it is a sacred symbol for the ethnic Karen inhabitants. They worry the mountain will be destroyed because the company set off explosions during its testing. A KNLA official says gold mining is being carried out in the KNLA Brigade 5 region, near their own territory. Some Chinese companies have gotten involved with KNLA Brigade 5 officials and they are making good money, he says. Businessmen have rushed in to buy farmland while rank-and-file KNU officials and small-scale landholders have divvied up properties to sell. He also said that small-scale landholders tidied up uncultivated lands and demarcated boundaries with others’ fields. Businessmen are visiting the region looking for chances to make money. In short, the no man’s land is turning into a land of opportunity.